With the death toll rising dramatically to 652, more than 50,000 displaced and over 800 people still missing, aid and development agency, Caritas Australia, has requested urgent public support from Australians to deal with the large-scale emergency response needed in the Philippines. Typhoon Washi made landfall on Friday evening in the eastern province of Agusan del Sur and crossed northern Mindanao. That storm caused severe flash flooding on Friday night and early Saturday morning and continues to cause widespread devastation across northern Mindanao. The floodwaters destroyed roads and infrastructure in numerous cities and towns, leaving many of them very difficult to access, making the immediate response even more challenging. The magnitude of the disaster is continuing to unravel with the city of Cagayan de Oro City believed to have been among the worst hit with more than 34,000 evacuees and no running water. 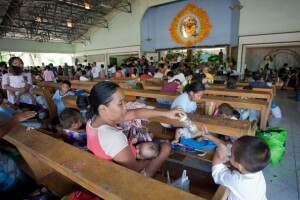 In response to the disaster Caritas Australia has opened its Philippines Floods Appeal. “We see the images on television and in the newspapers, but it is very hard for us to comprehend what a tragic and difficult time this is for the people of the Philippines,” Caritas Australia CEO, Jack de Groot, said. “It is vital that we act immediately so that we can do whatever is possible to minimise the harm inflicted by this typhoon through a well executed emergency response and ongoing support into the future. “Caritas Australia, the Caritas Internationalis network and its partners are already engaged in long term programs in the region and more broadly in the Philippines, so we are very well placed to engage in an effective emergency response. The provinces of Misamis Oriental and Lanao del Sur are also among the most affected. The magnitude of the situation is still revealing itself. Little is known about the impact on some interior cities. Representatives from the Caritas international network and local partners are working closely with the Philippine Government’s disaster response team. Caritas partners have been conducting needs assessments and aerial views of the region by helicopter have been carried out. Four network staff will also meet with the Philippines Government’s disaster response team. “The fact is, the sooner we can get on the ground in the affected regions and execute an emergency response, the better chance people will have of survival and access to required assistance,” said Mr de Groot. “This is a tough time for many of us financially, but in the Philippines the need is great and we ask that you come forward in support. That will help to ensure both the short and long term responses are effective,” Mr de Groot said. This entry was posted in Press Releases and tagged appeal, Caritas, Development, Floods, Jack DeGroot, justice, peace, The Philippines, Typhoon on December 19, 2011 by Mark Wei.